Gold futures realized a second day of gains Thursday while silver futures closed higher for the first time in six sessions. Gold for August delivery added $3.60, or 0.3%, to settle at $1,249.40 an ounce on the Comex division of the New York Mercantile Exchange. The close was the strongest since Friday. "Yields are getting lower and lower and that’s going to push investors into the metals market, specifically into gold," Bloomberg News quoted Phil Streible, a senior market strategist at RJO Futures in Chicago. "With lower crude oil prices, you’re going to see a sector rotation out of energy and into assets like gold. People think the economic data is going to look weaker and the Fed will start to question their stance." 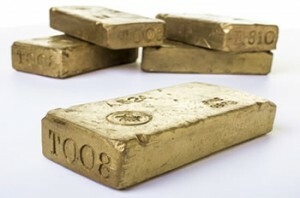 Gold futures ranged from a low of $1,246.40 to a high of $1,256. They rose 0.2% on Wednesday, slipped 0.3% on Tuesday — marking their weakest close since May 16, and lost 0.8% on Monday. Elsewhere, silver for July delivery tacked on 13.5 cents, or 0.8%, to settle at $16.509 an ounce. Silver futures traded between $16.40 and $16.64. They declined 0.3% on Wednesday, fell 0.5% on Tuesday and declined 1% in their start to the week on Monday. July platinum shed $1.40, or 0.2%, to $925.60 an ounce, ranging from $922.40 to $935.20. Palladium for September delivery gained $4.05, or 0.5%, to $880.50 an ounce, trading between $874.80 and $887. Gold added $8.30, or 0.7%, to $1,250.80 an ounce. Silver added 7 cents, or 0.4%, to $16.58 an ounce. U.S. Mint bullion sales were unchanged as of 3:40 p.m. ET. Below is a sales breakdown of U.S. bullion products with columns listing the number of coins sold during varying periods. Products with an asterisk (*) are no longer available.